Notre Dame got off to it’s typical start with Book behind center. 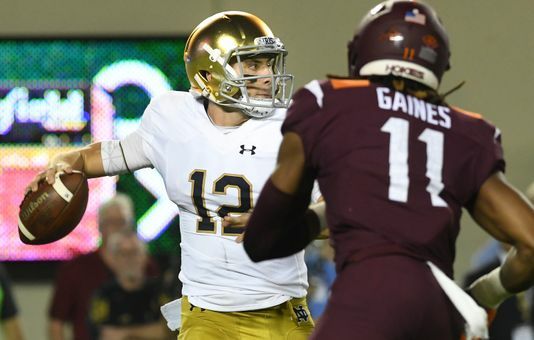 The Irish jumped out to a 10-0 lead and the offense seemed in rhythm. But, a funny thing happened after that. Book struggled hitting open receivers. The running games wasn’t going anywhere. For the first time with Book as a starter, the offense looked ordinary. With a 17-16 lead at the half, the Irish didn’t seem to make adjustments, they just executed better. The defense held the Hokies on their first drive of the half and then Dexter Williams took over. After being pinned deep in their own territory, Dexter Williams happened. Williams took advantage of the Hokies over-pursuing on a stretch run by cutting back to daylight. With no Hokie in sight, Williams would go 97 yards for a touchdown. “There’s no levels to that defense. If we could get through that first level, we were pretty confident that we could get a chunk play” said Coach Brian Kelly. That gave pushed the Irish to a 24-16 lead and the avalanche began. Myles Boykin caught a 40 yard touchdown followed by a 5 yard touchdown and reception and just like that the lead was 38-16. The Irish’s ability to explode on offense is the difference between this team and some of the teams in the past. Book gets a lot of the credit and it’s well deserved but Williams’ return can’t be undervalued. For the second straight week, Williams set a career high. He ran for 178 yards on 17 carries. With teams having to defend the Irish’s potent passing game, Williams and the rest of the running back corp will have lanes that will provide opportunities for “chunk plays” as Kelly would call it. Without continually harping on Brandon Wimbush’s shortcomings, the lack of passing efficiency is what made games against Ball State and Vanderbilt closer than they should’ve been. Defensively, Notre Dame was much better in the second half but their season will ride on getting pressure from the front four. When the Irish can get pressure without blitizing, DB’s like Julian Love can let their talent show. Furthermore, it makes the Irish blitz more effective when they decide to bring extra pressure. Love’s touchdown at the end of the first half was a combination of how good the defense can be. Khalid Kareem flushed Hokies’ quarterback Ryan Willis out of the pocket. When Willis double back Kareem popped the ball loose allowing Love to scoop and score. It was a huge play at the time because the offense was struggling. There’s a long way to go in the season but Notre Dame has put their name in the hat for the College Football Playoffs. To stay undefeated, the second half of the Virginia Tech game will be the blueprint to stay undefeated.